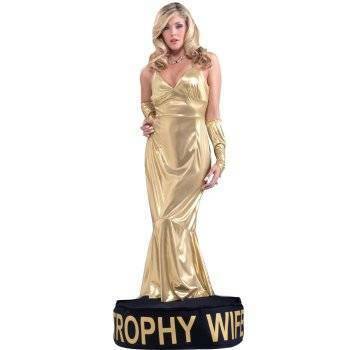 I'm Sorry...Did You Just Call Me A Trophy Wife? I thought to myself, "What in the world did she just say to me?" A few years ago, our family was attending my husband's 20th high school reunion in Alabama. We had a nanny traveling with us to watch the kids while we attended some of the weekend's events. We now know that she was a little crazy, but nevertheless, these were her words to me. As our family approached the picnic area, the nanny said, "Okay, are you ready? It's time for your husband to show off his trophy wife and children." Had I not been so shocked, I probably would have fired her right on the spot. I tried to dismiss her nonsense and gather my thoughts, but of course I instead started panicking, "Are people going to really think this about me? Certainly not. None of my friends back home think this of me. Really, does this girl even know me? Maybe my husband wishes I was a trophy wife, but too bad for him that he has the real me! I mean, I am from Dallas, but I am not really from Dallas!" Her comments seem laughable to me now...and even a little back then...but over the last few months they have come back to play in my head over and over. The words haven't come back to me because I am striving to achieve that lifestyle, but rather instead as a sober reminder of the ways in which we try and build ourselves up in this life using flimsy materials. One of the happiest days for our children is the day they receive their first trophy. At the ages of 3-6, usually children get trophies strictly for participation, not for actual super achievement. They are so giddy and excited. It is always interesting though to watch the expressions on some of their faces when they realize how light the trophy is, that the trophy feels like plastic instead of something more grand, or that sometimes, their names aren't even on them. They love the trophy, but realize it really is not that big of a deal after all. Sometimes, our lives are like that. We think that the next big job is going to fill that space in our life. Or that the next person who chooses to love us is going to make us feel so much better about ourselves. Or that having a social calendar that is out of this world is going to define us as being popular or make it seem that we are so happy. When in fact, these things are the hollow inside our plastic trophies. Without a solid foundation and a strong mooring, the trophy usually breaks apart from the base. And if there is no foundation, that trophy can't stand on it's own. Trust me, we have some baseless trophies lieing around. In a way, maybe I was a trophy wife during that period of my life, but not in the same sense that the nanny was referring. I was busily trying to fill my life with stuff, purpose and power because I (the trophy) was completely hollow inside and I desperately wanted it to be solid and heavy. It wasn't until I started looking at my foundation that I realized that I was in danger of separation from my base. Once I got my base firmly planted, I wasn't the one who started filling me up and making me whole, glittery or shiny, it was God, who in His infinite power and wisdom knew exactly what it was going to take to fill me up and make me whole, solid and strong. Trophy wife is definitely not on my list of things I want to be when I grow up. Instead, I want to be known as a living woman that has been and still is being completely formed and molded by the breath and hands of God. "And yet, O Lord, you are our Father. We are the clay, and you are the potter.